New age Born gifted psychic, clairvoyant,intuitive expert tarot reader,spiritual adviser, counselor. I am tested and prouven psychic 4th generation! no sugarcoat I give only the truth. 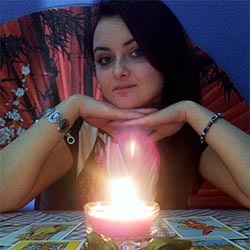 Specializing Love,Relationship I am here to give you answers trough Tarot using my psychic ability.I also offer counseling for people in need or for those who need someone to understand them ,I give practical advises ,spiritual advises,I am here to help you get through life congestion, energy blockages,depresion,tough decisions in life.I am here to be more than a Tarot reader,counselor,spiritual adviser,I am human like you or like anyone else,I am here to offer my time and my friendship.I am open to help people anytime.